A trio of True West pints (from left): Campfire Session Nitro, Fuego Sunset Red IPA, and Walden Pond Wit. When you talk with Peter Henry of True West, a new brewery and restaurant in West Acton, it’s clear that he’s keen on forging partnerships where everybody wins. That win-win approach is evident in the brewery’s “village supported” model. “We’re not only creating a local craft brewery, but engaging the community while we’re doing it,” says Henry, who owns the place with his wife, Stephanie, and younger brothers Matthew and Joshua. (Joshua is also brewer at 7th Settlement, a brewery-restaurant in Dover, N.H.) Russell Carpenter is head brewer, and Kevin Helm is executive chef. Like a CSA for produce, folks purchase shares in the form of annual memberships. 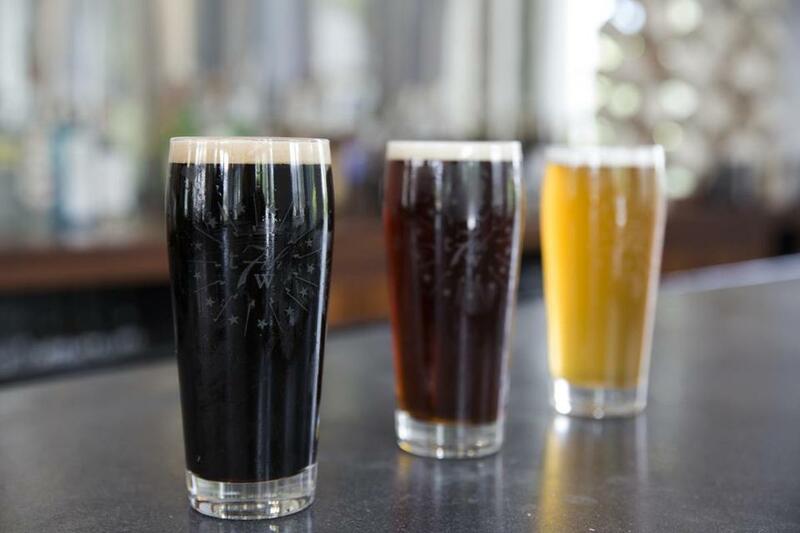 Those shares purchase raw materials like imported yeasts and malts to make a dozen “true to style” pours. Each member gets access to special-release beers, events, and a designated ceramic mug that lives behind the bar. “We opened with 250 shares and they are all sold out,” Henry says. “There are 180 on the waitlist.” Fortunately, you need not be a member to purchase a growler to go (that’s a jug, in beer-speak), or sit a spell and order delicious hand-crafted fare. The Spicy Pig burger — with cheddar, hot sauce, and pork chili — and hand-cut fries. Spent grains are also folded into dough that is rolled thin and baked crisp as flatbread. A version with chorizo ($13) layers crumbled house-made pork sausage on an oblong crust, with red sauce, cheddar, and oven-roasted plum tomatoes. It’s delicious, spicy, and designed for sharing. Those same grains are used as breading for cod, tucked into flour tortillas, in a trio of fish tacos ($13). Shredded cabbage and roasted tomato salsa provide crunch and savor. The only thing lacking is cilantro to punctuate the dish. 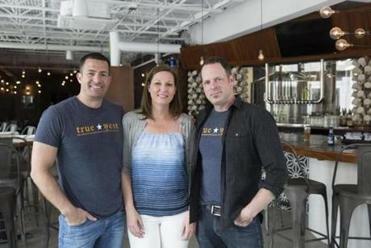 From left: Owners Matthew, Stephanie, and Peter Henry. We can’t decide which beer we like more with dry-rub wings ($12), which arrive with ranch or mild blue cheese dressing. Fuego Sunset, a red IPA, features flavors of coffee and burnt citrus, while a smoked porter called Campfire Session Nitro showcases sweet wood smoke and dark chocolate. 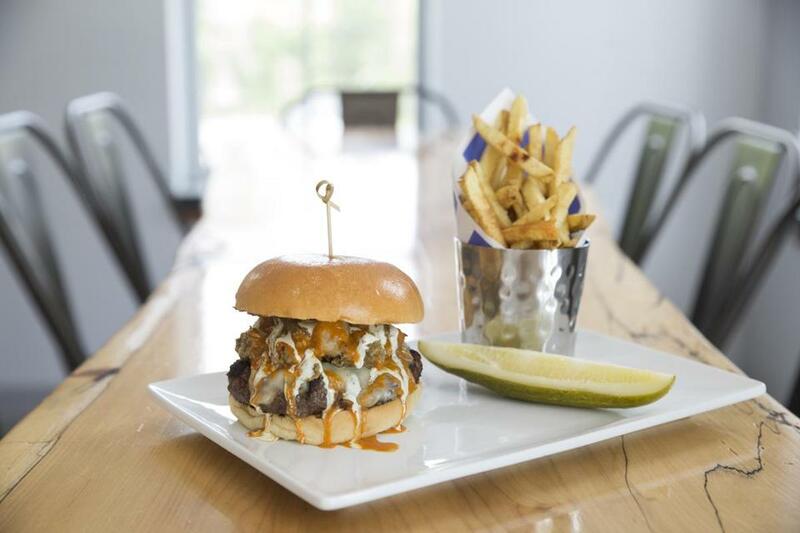 Both are refreshing with a toothsome burger called the Spicy Pig ($15), a beef patty topped with cheddar, hot sauce, and pork chili, accompanied by crisp, hand-cut fries. A thoughtfully composed harvest salad ($8) piles tender baby kale in a plate’s center with herb-roasted butternut squash and dried cranberries nestled alongside. Beet juice gives the honey-sweetened dressing its fuchsia hue, and roasted pepitas provide delightful crunch. A Belgian wheat ale called Walden Pond, cool and cloudy, is a natural pairing. One early Saturday evening, several guests head for the sunny deck to dine beneath patio umbrellas. Inside, the interior is light and bright, and so is the mood. Peppy, knowledgeable staff ferry drinks to gal pals at a communal high-top. Families arrive with young ones in tow, headed for a cozy space in back. At the bar, we spy jovial septuagenarians in golf shirts, ceramic mugs in hand, happily doing their part to make this a winning neighborhood spot. Prices Appetizers $4-$12. Soups and salads $5-$9. Burgers, flatbreads, entrees $8-$16. House-made beers $6.50 a pint. Hours Mon-Tues bar snacks 5 p.m.-10p.m. Full menu available Wed 4 p.m.-10:30 p.m., Thurs 4 p.m.-10:30 p.m., Fri and Sat 12 noon-10:30 p.m., Sun 12 noon-9:30 p.m.
What to order Tots, chorizo flatbread, fish tacos, The Spicy Pig burger, harvest salad.